The PAT Testing Competency course is the best way to get competent fast. Whether you are a business looking to bring your PAT testing in-house or you are an individual looking to gain a new skill to start your business, this course will give you the skills and knowledge you need to get started. The course is heavily based on the IET Code of Practice for In-service Inspection and Testing of Portable Appliances. It will take you through the legislation, procedures and practicalities of day-to-day pat testing. You will get your own PAT testing hand book to guide you through the course, along with a handy test card to take away with you. You will also be taught how to identify the different classifications of equipment and which test procedures to use for each one. You will receive a Certificate of Competency in PAT Testing accredited by PASS. This course is suitable for anyone who would like to learn more about PAT Testing or who needs to carry out PAT testing as part of their current job role. It is great for Care Homes, Councils, Janitors and Caretakers, Landlords, Electricians, Musical and Theatrical, Schools and /or individuals who want to start their own PAT business. For anyone who carries out PAT Testing the IET Code of Practice is the industry standard publication. You will also get a copy of the PAT Testing Handbook as part of your course fees, this book is a great summary of all you know to know about PAT Testing. 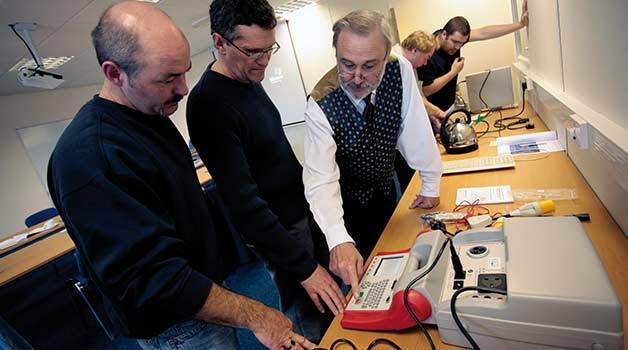 The PAT Testing Competency Course is one of our best selling PAT Testing Courses. This one day course is designed to demystify the subject of PAT Testing. It will give you both the practical and theoretical knowledge for you to carry out PAT Testing on your own. Up on successful completion you will be deemed to be competent in this important area of electrical appliance inspection and testing. This course is ideally located in the outer Manchester area and can be easily accessible from Stockport, Manchester and the surrounding Wilmslow areas.